Sonoran Sunset is a stone that has been pretty much mined out. It is hard to find good stones with dynamic color transitions as this one is. 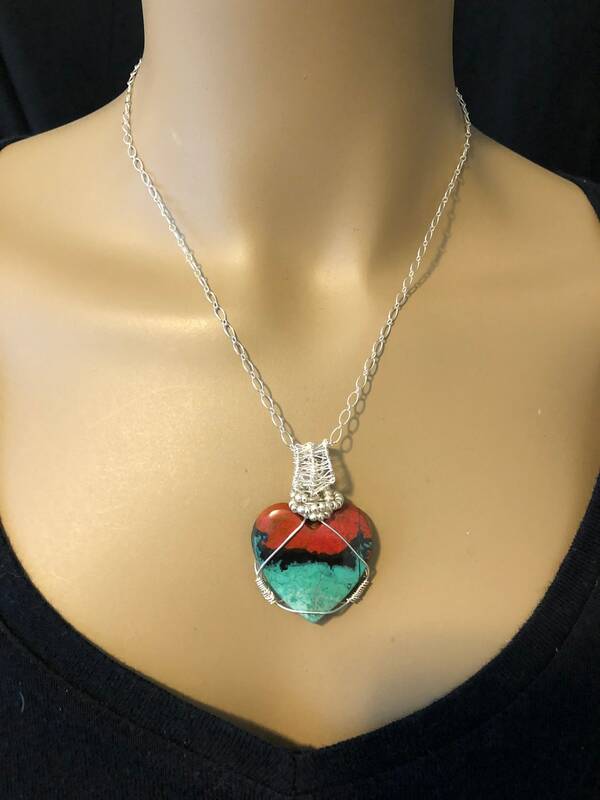 The pendant, including the bail is 1 3/4 x 1 1/4 inches. The wire and chain are sterling. Sonora Sunset often spelled as Sonoran Sunrise or Sonora Sunrose and Sonoran Sunset. It is a gem nugget that is formed by the combination of bluish-green and black tinted Chrysocolla and copper-red Cuprite. Sonora Sunset speculates as a gem nugget of empowerment that too infuses freedom in the life of the soul. The fused energies of two stones in a single gem serve the spirit soul to get out of the stuck routine. The reverberating vibes of the charismatic gem nugget too serve the soul to achieve acknowledgment as well as control the intellectual and emotional torso in the troublesome situations. Further, it provokes the feeling to empower self as well as bestow passion to handle each phase of life assertively. Sonora Sunset as the name suggests, it is a gem that ends the rule of off-putting energies in the life and brings new hope, freedom to lead a future life beautifully. It holds the energies of Cuprite, so speculate to hold the potency of copper too in healing the general torso of the soul. The healing potential of the stone too evokes humanity, furthermore aids opening as well as connecting the throat chakra in addition to base and sacral chakras. The energies of the Sonora Sunset trigger the base chakra and infuse the feeling of security. It too proffers shield to the soul in terms of the physical torso. Further, the energies likewise regulate the energy flow as well as cleanse the blockages for the proper flow of the energies in the overall torso. It likewise raises the frequency of energies to heal the overall torso, moreover strengthen the grounded soul and physical torso to gain the potentiality to handle upsetting situations of the life. Aside from healing the physical torso, it too mends the intellectual and emotional torso for a sound living. Sonora Sunset is predisposed to help the soul to augment the courage to face the challenges as well as enhance the creativity to solve the problems smoothly and easily. Furthermore, the energies of the stone too obliterate stress, fear as well as anxiety. It is speculated to possess the properties of the gem nuggets Chrysocolla and Cuprite. It likewise brings clarity in thoughts and help to stay cool and balanced during distressing situations of life. The reverberating energies of the stone further eliminate edginess moreover irritability to fight the stressful conditions. The vigor of color energies of the stone roots out hypertension in addition to the feeling of guilt as well as evoked the feeling to speak the truth. The energies of two stone in a single gem make it a highly regarded gem nugget to heal the overall physical body along with the troubles of throat and lungs. The vibrations of the energies of the fusion of two stones turn the heart chakra on and wipe out the negative energy blocks from the emotional torso completely. The enthralling tints of the stone too contemplate to yield flexibility as well as induce patience. It likewise releases the feeling of guilt and help to forgive self. Further, the activate throat chakra lets the soul express feelings either through verbal expression or artistic creativity. Sonora Sunset that is assessed to hold the potential of Chrysocolla helps to detoxify poison from the overall torso in addition to physical parts. It cures the issues of the blood pressure, moreover shield the soul from infections or fevers as well as help to get relief from muscle cramps. The combination of the energies to infuse a new potent vibe in Sonora Sunset too proffers spiritualism as well as help to attain spiritualism and spiritual benefits by turning on the third eye chakra. Chrysocolla potency in the gemstone too holds the power of copper that helps to root out the pain effectively. The beautiful and charismatic Sonora Sunset is pulled from the regions of Northwest Mexico that edges Arizona and New Mexico. The fused energies of Cuprite and Chryosolla accelerate the vivacity and vigor of the torso and activate the chakras related to the color radiating energies of the stone. It too links the soul to the grounding potency of the Mother Earth as well as helps to stay rooted. Further, it gives a boost to the hidden potency to accomplish the goals of life. The energies of the stone not only open the heart chakra but too help to accept love and respect the beauty of nature. Furthermore, the energies of Sonora Sunset too help to satisfy the physical needs and control the emotions. Where is Sonora Sunset found? The beautiful and charismatic Sonora Sunset is pulled from the regions of Northwest Mexico that edges Arizona and New Mexico. Sonora Sunset, a holder of the energies of the two stone, i.e., Chryosolla, Cuprite, encourage to explore the highest hidden knowledge of the inner self. Furthermore, it too helps to gain the benefit from the same for leading a future life conveniently. It likewise considered a potent stone for those who seek a livelihood. There is one very strange property that is attached to this stone since ancient times is that it heartens the populace to stay at abode. It speculates as the stone for hermits, monks, and the prisoner that diminishes their feeling of being secluded and aloof from their family and closed ones. The resonating vibes of this alluring stone edify the beliefs of humanity and kindness, furthermore support the soul to explore the past life and get experience from it. It too helps to overcome difficulties by acting as a spiritual guide. Sonora Sunset is an amazing gem nugget that strengthens the willpower and allows the soul to learn the responsibilities of life. This stone is a powerful gateway that gives vigor and vitality to the soul to fight the challenging situations of the life. In tradition, Sonora Sunset tends to hold the soothing effect on the physical torso and due to the presence of copper in it helps to elevate pain and muscle cramps soon. It effectively heals the issues related to thymus, heart as well as imbalanced metabolic rate. The energies of the stone help to mends the troubles of muscle tissues, the supply of the oxygen and stamina to proffer a perfect skeletal system. It too deals with the issues of kidneys, hormonal imbalances, water retention and menstrual pain problems in addition to vitamin absorption. Sonora Sunset bestows the calming result while dealing with the issues of nervous disorders like depression, anxiety, feeling of guilt. It too speculated beneficial for women, as it enhances fertility and menstrual pain. 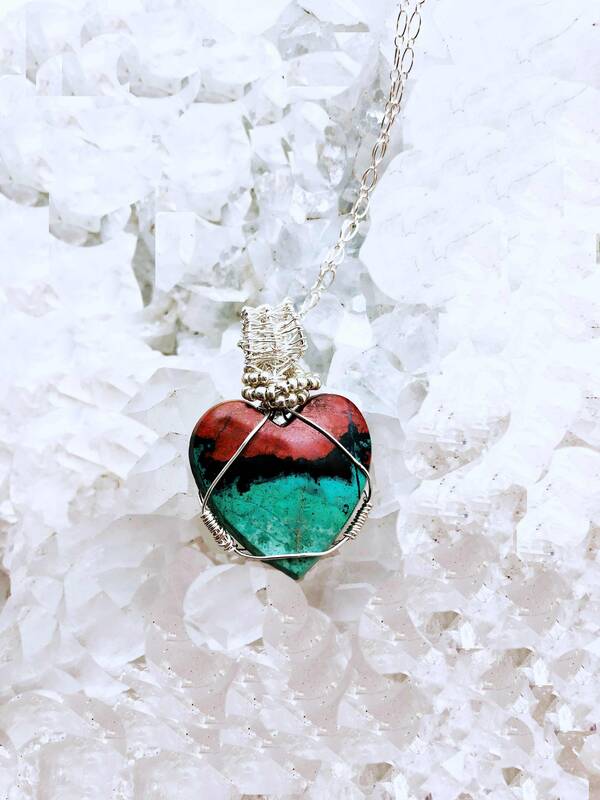 The energies of Chrysocolla in the stone too regulate glands, like thyroid and adrenals. The bluish vibes of Chryosolla in the stone soothe the problems of the larynx in general. It likewise cures the troubles of blood pressure and blood sugar in addition to the lungs. The reverberating energies of two stones in Sonora Sunset-help to cure the issues related to digestion, joints, especially hip joint, arthritis, and rheumatism. It too releases the pains and muscle cramps as well as diseases, fever and blemishes. Sonora Sunset contemplates as a grounding and an equilibrating gem nugget that anchors the positivity in the life. It too helps the soul to stay in the present by forgetting the distressing past. It too helps to restore the lost vivacity; it too infuses motivation as well as kindles creativity. The energies of the stone too augment concentration. The energy of the stone likewise shields the soul against rage and envy. It too helps to overcome with the feeling of abuse. The vigor of Sonora Sunset roots out the feeling of jealousy and over possessiveness in kinships. It too teaches to express self and speak the language of silence. Sonora Sunset triggers the intuitive qualities as well as a root out the off-putting emotions. It too helps to understand the feelings of others and align the energies of the self with that of the energies of the cosmos. 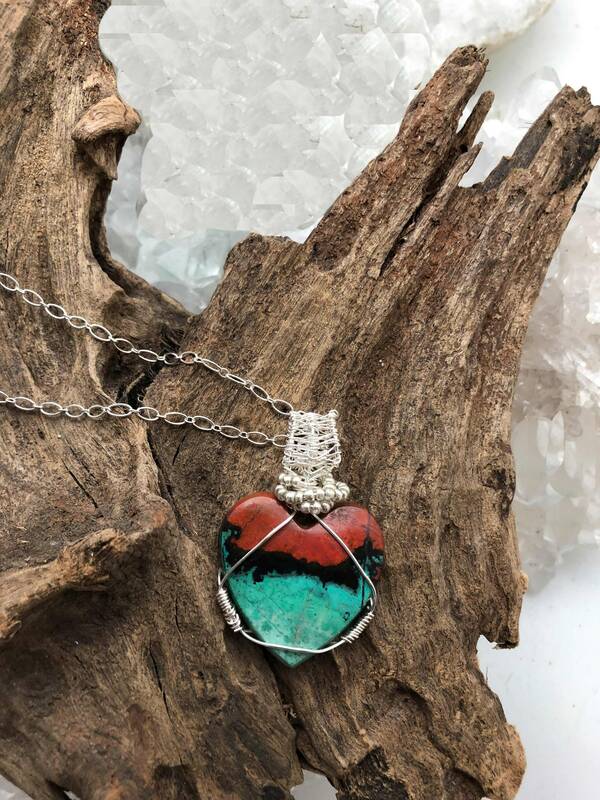 The vigor of the colors in the stone imparts confidence as well as boost the personal power to connect with the divine forces. The energies of the stone too help to accept the up and downs of the life as a necessary phase, moreover boost positivity. Sonora Sunset due to its eminent properties contemplates as a stone of action that helps the soul to face the situations as well as trust the powers of the divine. It proffers a strong connection between the inner and outer self along with the energies of the cosmos. It too promotes the spiritual power, moreover energy to awaken the hidden talents of the self. It too bestows love between kins and romantic mates, furthermore connect the soul to the higher self to gain understanding of the past. The blue and reddish shades of the Sonora Sunset activate the throat chakra along with the base and sacral chakra. The energies of Chryosolla and Cuprite control the flow of energy in the overall torso and help to align the free energy of the torso to the central gravity of the spirit. The triggered chakras too maintain the flow of information from the mind to the overall body and back from the body to the intellect. Throat chakra helps the soul to express the thoughts and ideas freely and openly to others without any hesitation. The eminence of Sonora Sunset too aligns the energies of the chakra with the energies of the overall torso to obliterate the negative out and balance the soul. It too helps in the non-linear communication by releasing confusion and dependency on the people around. The triggered base chakra helps the spiritual soul to connect self with the energies of the Mother Earth and feel grounded. The activated base chakra likewise clears the energy blockages and help to gain the vital information and understating from the mother nature. Furthermore, Sacral chakra leads to independence and proffers the courage for spontaneous leadership. Sonora Sunset comes from the state of Northwest Mexico that edges Arizona and New Mexico. Sonora Sunset holds the copper content in large quantity as Chryosolla and cuprite both contains copper content.Sonora Sunset is mined from Mina Milpillas, Mun de Santa Cruz and Cuitaca in addition to the mines of Sonora, Mexico.The mines in Mexico to extract Sonora Sunset were opened in 2006.Sonora Sunset is pulled from the mines from where copper is too extracted.Sonora Sunset is known to public for around 30 years now ity to the soul to fight the challenging situations of the life. Sonora Sunset is predisposed to help the soul to augment the courage to face the challenges. Sonora Sunset too enhances the creativity to solve the problems smoothly and easily. Sonora Sunset often spelled as Sonoran Sunrise or Sonora Sunrose and Sonoran Sunset. Sonora Sunset is a gem nugget that is formed by the combination of bluish-green and black tinted Chrysocolla and copper-red Cuprite. Sonora Sunset speculates as a gem nugget of empowerment that too infuses freedom in the life of the soul. Sonora Sunset activates the sacral chakra that often leads to independence and proffers the courage for spontaneous leadership. Sonora Sunset is a combination of two gemstones Chroyosolla and Cuprite and tends to hold the color energies of the both. It is often seen holding the tints of Bluish-green, Blue, Green, Red shades along with black. I also love to do custom orders and will gladly create any item to suit your needs. I would love to hear from you! I can provide almost any type of stone, cab or crystal that you would like or can work with your own favorite stone that you have collected. Check out luvmesomevintage.etsy.com for my vintage items.